January is the height of Winter in most Northern hemisphere countries. The pro cyclocross racers are peaking for their National and then World Championships while the road cyclists are busy looking for warm dry climates to train in. Not in Australia! January in Australia is the height of Summer and brings their National road championships. January also features several top level pro road races. These races are typically dominated by the Australian racers due to the timing of their National championships. Also, most stage racers are just starting their training program with an eye on big races to come in May, June and July. Caleb Ewan dominated the early season races in Australia. His sprint victories in The Tour Down Under, Mitchelton Bay Cycling Classic and The Australian Elite Men's Criterium Championship showed everybody that he may be the next top level pro sprinter to come from Down Under. We'll see how things play out in the Tour de France in July. That will be the next big opportunity for Ewan to show he may be ready to take the sprinter's baton from Robbie McEwan. This week's matchup features a Washington Syrah taking on an Australian Shiraz in honor of the early season Australian racing. Aged for 18 months in American and French Oak barrels. Provided as a sample by the winery. Available at retail for $25. 100% Shiraz sourced from warm climate vineyards in the Barossa Valley, McLaren Vale, Langhorne Creek, Wrattonbully, Port Lincoln and Clare Valley. Purchased for $26.99 at Total Wines. Skylite Cellars climbs into the ring ready to rock the Australian challenger's world. The nose is showing dark logan berry, blue berries, smoky sandalwood and savory dusty notes. The palate doubles down on the blue berry followed by smoky minerals and a slightly tart cracked pepper finish. The Penfolds Bin 28 is showing some silky smooth kung-fu moves! The nose starts with creamy vanilla followed by dark blueberries and finally wraps up with dusty light spices. The palate also shows dark fruit with slightly tart vanilla and cocoa notes rounded out with a dry finish packing a solid tannin fueled punch. Skylite brought aggression to the ring and took round 1. The Skylite luchador is bulking up and bringing the power for round 2. The nose is showing dark fruit, plums and smoky savory mineral notes. The palate is equally bold with dark fruit, plums and sweet dark savory notes that are completed with a dry cracked pepper finish. Penfolds isn't backing down. A powerful attack is hiding behind that silky smooth facade. The nose is bringing dark fruit character backed up with sweet vanilla cream and herbal spices. The palate jumps out like an Atomic Elbow Drop with dark fruit, dry cocoa powder and vanilla bean with a light white pepper spice driven finish. Round 2 goes to Pelfolds and that evens match 1-1. This is it. The winner of round 3 will take the match. 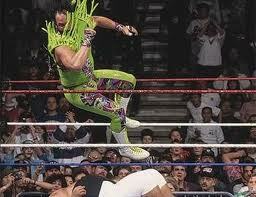 Who will step up and who will wilt under the pressure? Game on! Skylite is determined to protect the Washington State name and leaps into the ring with malicious intent. The nose is continuing to build with dark fruit, blueberries and dusty mineral spices. The palate brings dark fruit, blueberries, light savory cracked pepper, dusty minerality and a slightly tart finish. Penfolds is also rising to the late round challenge with a nose of dark creamy fruit, vanilla barrel notes and some savoriness. The palate fires off with dark fruit and savory light pepper notes followed by a finish of light cracked pepper and a touch of cocoa powder. Both of these luchadors delivered the goods in round 3 making it tough on the judges to score the final round. After huddling to compare scores the judges award the round and the match to Skylite Cellars. Both of these Syrahs showcased the character of their respective regions. 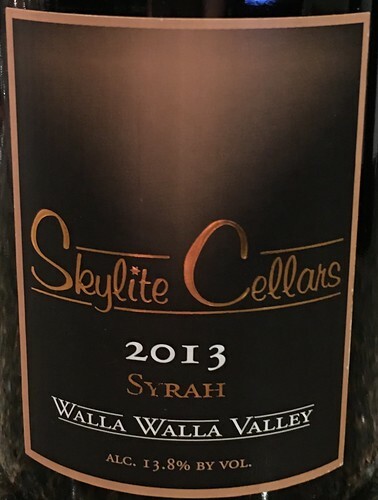 The Skylite Cellars River Rock Syrah showed the earthy, savory, minerality associated with the Rocks District. The Penfolds Bin 28 showed plenty of warm climate character along with creamy barrel notes. 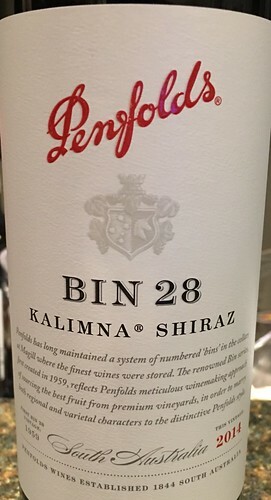 If you like Australian Shiraz, I think you will really enjoy the Penfolds bin 28. Likewise, if you enjoy the earthy minerality characteristics found in Syrah from The Rocks you will by happy with this Skylite Cellars Syrah. Both are great values at the mid 20 dollar price point.